The da Vinci Mini is 30％ smaller than da Vinci Jr. 1.0 and has a 5.9″ x 5.9″ x 5.9″ aluminum print bed for larger and finer prints. 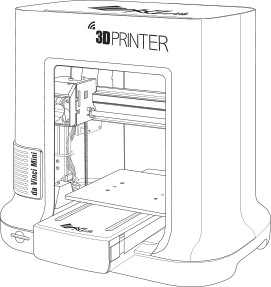 da Vinci Mini can connect wirelessly to your home network for easy 3D printing throughout your home, office, or classroom. Use XYZware to connect to your network and experience its updated slicing precision and computing efficiency, shortening the preparation time required before printing. 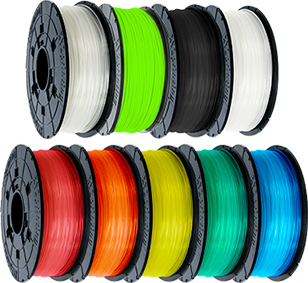 The da Vinci Mini filaments are made using PLA plastics derived from corn starch, making them biodegradable and non-toxic. XYZprinting filaments are tested extensively and are guaranteed to be DEHP-free and heavy-metal free. This filament is safe for the environment, and your home. Start your 3D printing adventure by downloading some of the 4,500+ FREE 3D models available from our online XYZ 3D Gallery. We have nine categories that include everything from toys and games, to art pieces and educational items. Make your dreams into reality with the FREE downloadable version of XYZmaker 3D modeling design software for beginners. Students and teachers get FREE access to our online curriculum education program, XYZprinting STEAM, which helps K-12 Science, Technology, Engineering, Arts, and Mathematics educators to incorporate 3D printing into their classroom.